Why Is Spring Batch Useful? Different readers and writers: You need the ability to talk to different kinds of data sources and sinks. These include talking to a database, an external messaging service such as JMS, and many others. Chunk Processing: If for instance there are a million records to be written to storage, it is a practical idea to split it into manageable chunks of 1000 records each, and write these chinks one at a time. Even if one such chink fails, the other operations are not affected. Ease Of Transaction Management: Transaction management should be simple to implement properly, even when using chunk processing. Ease of parallel processing: It should be possible to run the batch tasks using parallel processing. For this, it is important that the configuration be simple, so that overhead is minimized. tasklet: The task that needs to be done as part of this Step. Each execution of a Job is called a Job Instance. Each Job Instance is provided with a unique execution id, which is useful to restart the job if it fails. A Job can be configured with parameters. These can be passed to it from the Job Launcher. Each Job can have multiple Steps, and sometimes it is useful to organize the Steps into Flows. Different flows can usually be run in parallel, and the rest of the steps are run in strict sequential order. Spring Batch 3.0 supports JSR-352 - a Java specification for batch processing. Be careful about exception handling and transaction management. These become the most critical issues with managing batch programs. Deploy your batch programs as near to the data as possible. This improves their performance greatly, and that of the entire enterprise. Stress test the application from the start of the project. 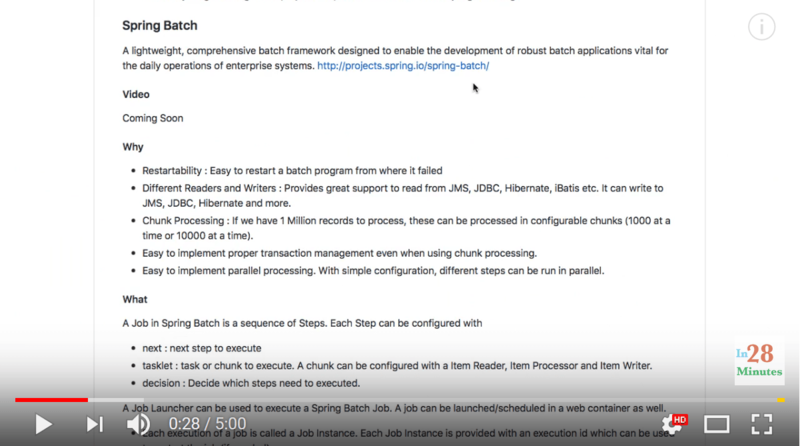 In this article, we had a good look at Spring Batch, a framework for crating robust enterprise-level batch applications. The needs of most enterprise batch applications are fairly the same. Spring Batch implements several best practices in developing batch applications.